In a Blink by Kiki Thorpe. A Never Girls Novel. Review: Anything can happen with faith, trust, and a little pixie dust! 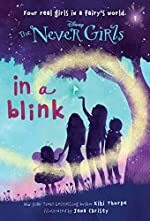 The Never Girls, In a Blink is a magical book and is the first book in a new series, The Never Girls, by Nikki Thorpe. The main characters of In a Blink are Kate and her friends. Kate is an adventurist who wants to be the first to come back to Never Land. They are all in the next book of the series. One day, the girls find a fairy named Prilla and she takes them to Never Land by accident. Once they're there, a weather fairy tells the girls they can go home between the next sunrise and the next sunset. With pixie dust everyone can fly, everyone that is, except Kate, who can't seem to get off the ground. Kate meets a fairy named Vidia for a flying lesson. Vidia gives her a sock and says to fill it with pixie dust all the way up to the top. Kate knows that each fairy is only able to get one fairy-sized cup a day but does it anyway. Kate starts to fly when she puts some of the pixie dust on, and all of a sudden, Vidia disappears, along with the other pixie dust. When the other girls wake up they find that Kate is gone. All the fairies go and look for her. Will the fairies find Kate? Will the girls get home before they are stuck on Never Land Forever? Never Girls, In a Blink is a must read for all young girls who love fairies and a story that is not only has mysterious fairies, but also has adventure and magic! The author's writing is interesting and although it begins slowly until they reached Never Land. It is intended for early chapter-book readers and is around 100 pages. In a Blink has a character that young girls can relate to and enjoy! Plus it also has fairies that, that may be familiar such as Tinker Bell, Queen Clarion, Terence and Vidia. Anyone who likes Peter Pan and Never Land you will love In a Blink, too! It doesn't have too many pictures in it like most beginner books do, but are not needed for comprehension. It is not a good book for boys of any age though, because, it is clearly geared towards girls. In a Blink has a cliffhanger at the end and starts back up in the next book, The Space Between. You should read it and enjoy it. You have to read the books to find out what happens next! We would like to thank Random House for providing a copy of In a Blink for this review. Have you read In a Blink? How would you rate it?